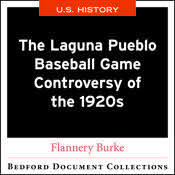 This document collection introduces students to a dispute at a baseball game played at Laguna Pueblo's annual fiesta on September 19, 1920, and the resulting campaign by the Pueblo superintendent to control the racial status of members of the laguna community. Through the careful analysis of the documents, students will understand and be able to explain how members of different social groups experience race in distinct ways. Students are guided through their analysis of the primary sources with an author-provided learning objective, central question, and historical context.